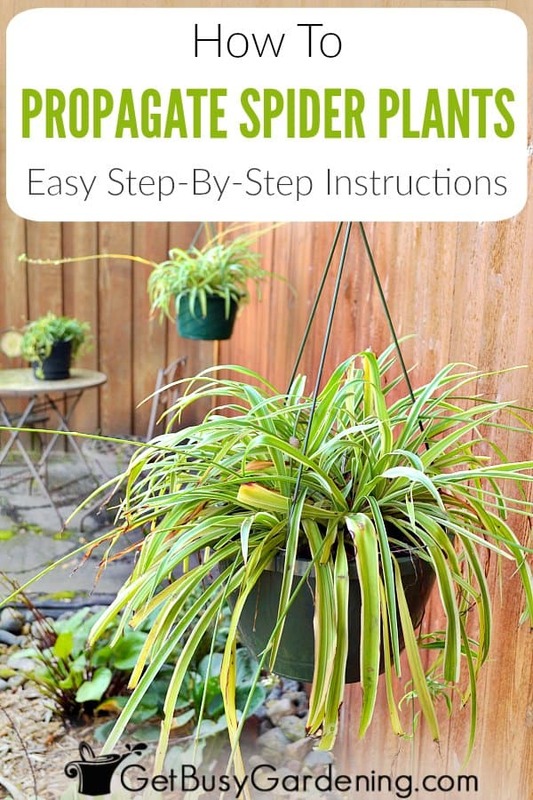 Spider plants are super easy to propagate, and there are a few different methods you can use. 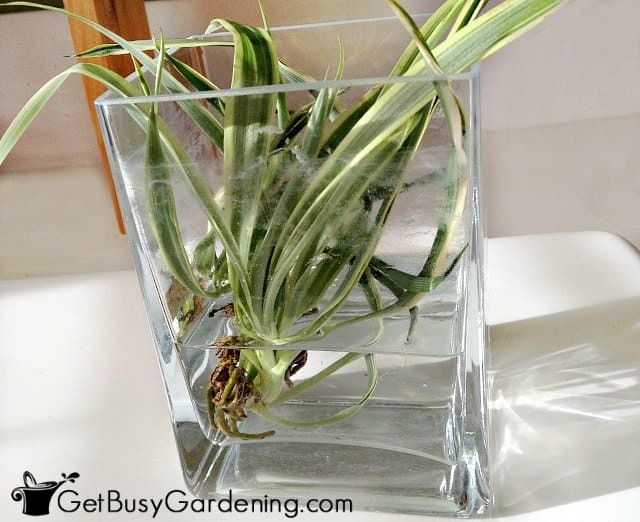 In this post, I will talk about the different spider plant propagation methods, and show you exactly how to propagate spider plants step by step. 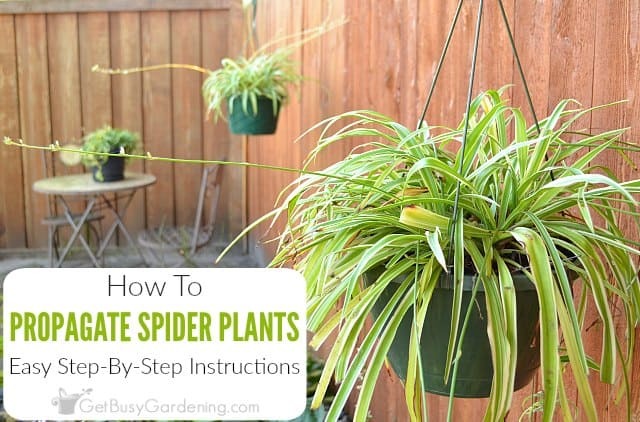 A reader on my Facebook page recently asked me to write a post about how to propagate spider plants. Well, the good news is that spider plants are one of the easiest houseplants to propagate. It’s so easy that soon you’ll have tons of new spider plant starts to share with your friends! 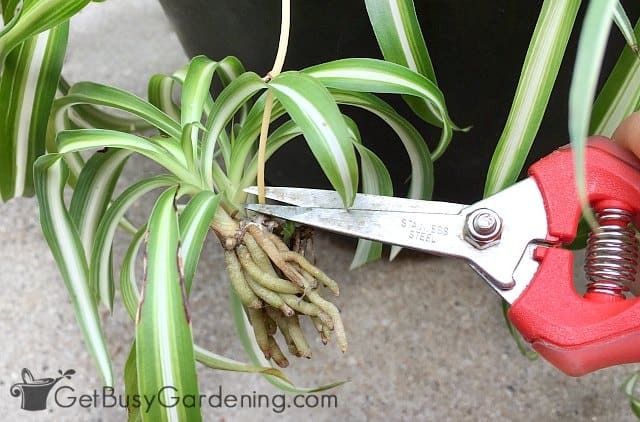 There are three main methods for propagating spider plants (Chlorophytum comosum, also called an “airplane plant”), and they are all really easy. These methods are rooting spider plant babies, propagating by division, or growing them from seed. In this post, I will talk in detail about how to grow spider plant babies, and also briefly touch on how to propagate a spider plant by division. If you want to try growing the seeds, then check out my post about how to collect and grow spider plant seeds. What Are Spider Plant Babies? Spider plant babies are the offshoots (also called spiderettes or plantlets) that grow out from the main plant. These offshoots will usually flower in the summer, and babies will grow out of the spider plant flowers if they’re not pollinated. If the flowers are pollinated, then they will produce seeds instead of plantlets. Once they are mature enough, the spider plantlets can be used to grow new plants. 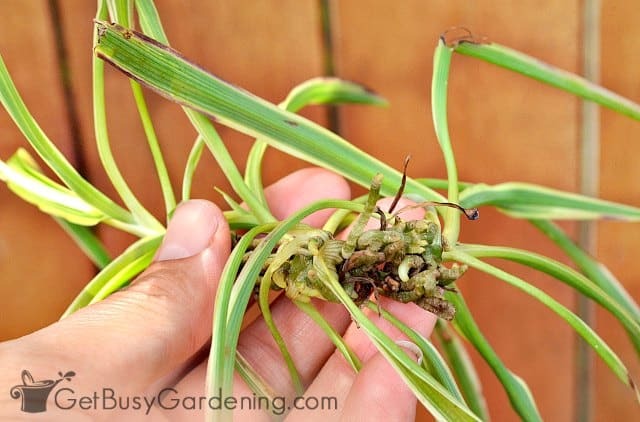 Growing spider plants from babies is the most common method of propagating spider plants, and there are a few ways you can do it. You can root them in soil while they’re still attached to the mother plant. Or you can cut them off and either root them in water, or propagate your spider plantlets in a propagation box. Starting spider plants from cuttings can take anywhere from a few days to a couple of weeks, depending on which spider plant propagation method you choose. I recommend waiting until the babies have begun growing starter root formations of their own before taking spider plant cuttings. If the spider plant babies have no roots, or you only see tiny nubs, then it’s best to wait until they’re a bit more mature. Once you determine a plantlet is ready to be propagated, you can remove it from the mother by cutting it off. Sometimes the babies will come off easily when you disturb them, and you don’t even have to cut them off. If you’re wondering where to cut spider plant babies from the mother, it really doesn’t matter. But I like to cut them as close to the spider plantlets as I can, just so there’s no ugly stem sticking out. Be sure to use a sterile pair of precision clippers so you get a nice clean cut. Once you remove the baby, you can prune the long stem back to the bottom of the next one up, or all the way to the main plant because nothing new will grow on it. 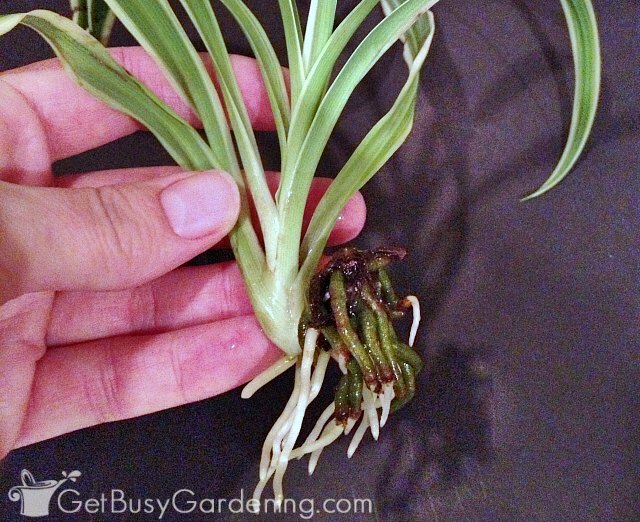 The easiest way to propagate spider plants is by putting the babies in water until new roots start to grow. The main disadvantages of rooting cuttings in water are that the plantlet could rot, and it can also go into shock when you transplant it into dirt. The babies tend to be weaker when rooted in water, and it can take them a while to recover after being planted in dirt. 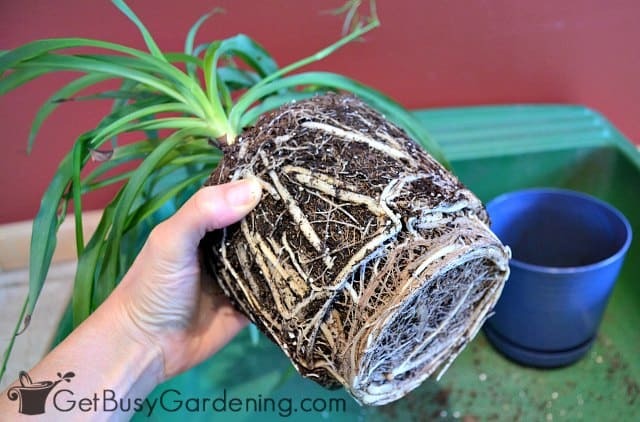 If you have problems with spider plant babies dying after potting them up, then you might want to try one of the other two methods for rooting them next time. 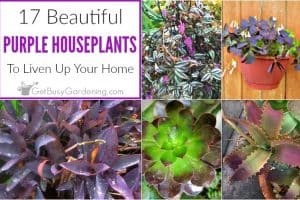 Before you put them in water, cut or pinch off any leaves that are growing at the base of the plantlet or under the roots. Any foliage that is submerged under the water will rot. I like using a deep, clear vase to root my spider plant spiderettes. Only fill the vase enough to cover the roots of the baby plant though. If the plantlet sits in water that’s too deep, it will rot. Using a tall skinny vase keeps the plantlets upright and helps hold the foliage out of the water. When you use a propagation chamber for propagating plant cuttings, it’s easy to keep the humidity level high. Humidity helps the spiderettes root faster. Baby plants rooted in this way are also stronger, and have less risk of dying from transplant shock than those that are rooted in water. You can buy a propagation kit or a mini greenhouse system, or you could make your own DIY propagation box. If you decide to make you own, adding bottom heat really helps to speed things up. You could also try creating a mini greenhouse by covering the plantlet and soil with a plastic bag. Don’t use regular potting soil in a propagation chamber though, it’s too heavy. 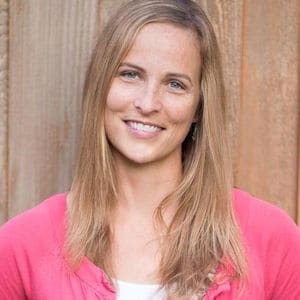 You’ll want to use a light soil mix of vermiculite, peat moss (or coco coir) and perlite or pumice for rooting cuttings. If you try this method, dipping the root nubs in rooting hormone will help the baby sprout roots faster. The benefit of rooting spider plantlets while they’re still attached to the mother plant is that you don’t have to worry about transplant shock. When you propagate spider plants this way, the babies are much stronger from the start. But this method is a bit more difficult because spiderettes still attached to the mother won’t always root as readily as they do when they’re removed. With this method, you could use regular potting soil, or the same light rooting mix you would use in a propagation box. Simply put a pot of soil next to the mother plant, and stick the starter roots of the baby into the dirt. I recommend dipping the root nubs into rooting hormone first to encourage and speed up root growth. Allow the plantlets to grow several new roots before potting spider plant babies. Then you can use a general potting soil to pot them up. After planting the rooted baby into its own pot, water it well, allowing the excess water to drain out the bottom of the pot. Keep the soil evenly moist until the plant has become established in its new pot, but don’t overwater it. You may also want to mist it daily using a plant mister, or keep it in a humid room (like a bathroom or kitchen) at first to help it recover. Cuttings rooted in water will take longer to recover after being transplanted into soil than those that are rooted in a propagation box or in soil. They may droop after being potted up, but they should recover after a few days. Once you see new growth, that means the plant is established and you can stop babying it. After they’re established, baby spider plant care is the same as it is for a mature spider plant. Dividing spider plants is another common way to propagate them, and the best option if your plant doesn’t have any offshoots. As long as there are at least two clumps growing in the pot, you can split them apart. Splitting a spider plant can be difficult if you have a mature, pot-bound plant. If your spider plant roots are really thick and tightly packed, then you will probably need to use a sterile knife to cut through it in order to split the plant. Otherwise, simply tease the roots apart until the clumps are separated. Spider plants are easy-to-propagate houseplants, and the perfect plant to start with if you’re just learning how to multiply plants! 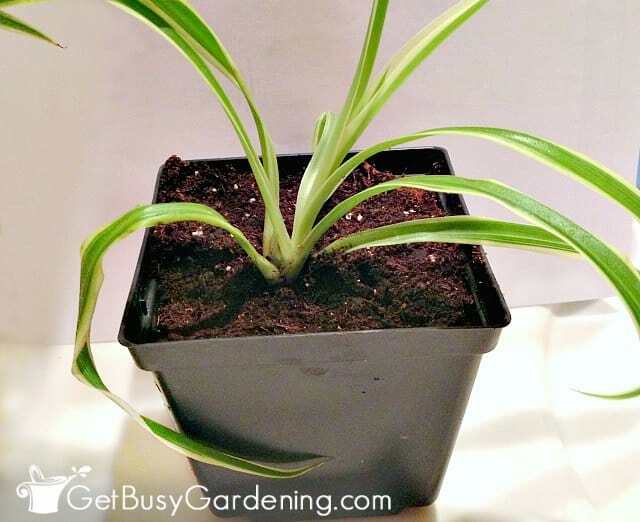 Growing spider plant babies is especially fun, and will allow you to propagate spider plants very quickly. Soon you’ll have tons of new plants to fill your home, or even share with your friends and family (baby plants make a great gift too)! If you want to learn how to multiply even more of your plants, then my Plant Propagation eBook will be your guide to propagating plants! 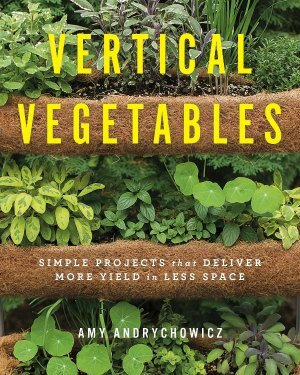 It will teach you the basic methods of plant propagation for beginners, and give you all the information on propagating plants you need so you can multiply any plant you want. Download your copy today! How do you propagate spider plants? Share your spider plant propagation tips in the comments section below. This is perfect timing. I do no have a very green thumb but wish I did. Believe it or not, I actually have a baby spider plant so I will give this a try. Awesome Nikki! Good luck, hope it works for you. Thanks Megan, I hope it goes well for you. where is the best place to cut it from the mother? right at the baby? or further up? If the baby is large enough, you could just pull it off the stem of the mother. Otherwise, you can cut the stem right at the baby. How long does it normally take for spider babies to grow roots in water? I'm trying to grow some for my science fair, but I'm rather pressed for time. The spider babies are my 'Plan B' so to speak, since my original idea crashed and burned. The plantlets I used in my photos for this post took two weeks to root, which is pretty fast. I had them in a room that has a south facing window so it stays really warm during the day, but gets cooler at night. To get your spider plant babies to root as fast as possible, keep them warm all the time (70-80F), and keep them near a light source. You don't want them sitting in direct full sun, but bright light would be helpful. Adding bottom heat will also make them root faster. Thanks for this, as well as the pictures! My work has 3 huge momma spiders and there are quite a few babies so I was going to try my hand at growing one or two of them. From the looks of it I've got two babies ready to go, hopefully I can manage to get them home with out squishing them! I have a ton of new spider plants from mine! So many, that I’ve been giving them as gifts! I had to divide the main plant. I also had to cut the roots horizontally. Will only the spider plant roots sprout a new plant? If so, how do I do that? How long should it take? Ha, ha, I’m in the same boat. I’ve started using my baby spider plants as fillers in my annual planters and in my gardens in the summer. They are beautiful! I’m not sure if the spider plant roots will grow a new plant or not, I’ve never tried it. I don’t think they will, but you could certainly experiment with it. I have inherited a spider plant, and it appears the mother plant has died as there is nothing growing except babies hanging from 2ft shoots. How can I save this poor plant?! I would cut the offshoots from the mother and root the spider plant babies in water or use a propagation box following the instructions above. I hope it will work out for you. My spider plant babies have grown nice little roots and I’m ready to pot. I live in AZ and will keep them in the house. What type of planting soil is best for their chances of survival? Thank you. Wow, that’s wonderful Sheryl! Just a standard, all-purpose potting soil will work great for potting spider plant babies. Awesome! Thank you for the insight Amy! This was just what I was looking for! Now I can separate the mother spider plant and start spouting roots on the baby ones. Thankyou! Wonderful, I’m so glad I could help!! iv brought some spider plants from Amazon iv only had them planted for 2 weeks and so far iv counted 5 baby plants starting to grow on the stems and more starting to come I’m not very green fingered but they seem very easy to grow I just spray them every day iv been reading the comments so I’ll follow what you’ve said on how to grow the baby’s thank you for your help also I’m trying to grow cactuses from seed have you got any info on them. You’re welcome! I don’t have any posts about growing cactus plants from seed, but I have done that before. They are really, really slow to grow so be patient. Also, keep the soil on the dry side once you start to see sprouts. Seeing tiny baby cactus plants is super cute. 🙂 Good luck! I saw the post about the rubber treee plant. I have one and its very tall. I heard I can cut and propagate them. How did it work for you. Rubber treee plants you can’t cut and stick in water. Ive read several different processes. I don’t have a post about propagating a rubber tree (I should though! 🙂 ). I have never tried rooting a rubber tree cutting in water. I would be worried that the cutting would just rot, but you could experiment if you have multiple cuttings. In the past I’ve used my propagation box to root rubber tree cuttings, and it worked great. I have fed n watered my spider. It gets south west facing sun n has lots of babies. But nothing I do seems to help keep the tips of momma plant from turning brown. I even cut off all the babies once. It might be pot-bound and needs to be replanted into a larger pot. Here’s a post I wrote about repotting houseplants… Tips For Repotting Houseplants. 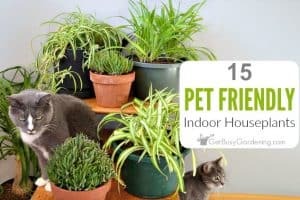 Spider plants also really like high humidity, so try moving them to a more humid room if you can, or adding a humidifier next to them to help prevent brown tips. I found the best way to root the babies is putting them in bottle distilled or spring water an set them on top of the fridge an the get starter roots in less then a week. Also I think this may help people if you have a baby with some babies starting to grow leave them on don’t cut them off they’ll grow I found this out this year when I took babies from a local restaurants plant the babies were a inch long that was a month an half ago they are now about 7inches long the runner bloomed too so if your spider plant babies have babies they’ll still grow even off mama. I put my spider plants outside in a shady spot all summer long, and by fall they are covered with new babies. 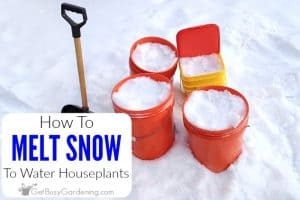 You could also try giving yours some fertilizer like fish emulsion or a liquid compost tea. Plants love those types of fertilizers! No, don’t remove the offshoots or the plantlets from your spider plant unless they have starter root nubs. They can just stay on the mother plant until they are ready to be removed, and that’s when you’d put them into a vase of water. just bought one. and i don’t have a green thumb. the closet one by far is you, depending how responsive you are. Awesome, I hope it will grow well for you! Once the spider babies are off of the stem, do I leave the stems on the adult plant or should they be cut off or cut back in any way? It won’t hurt to leave them on the mother plant, but eventually they will turn brown and die anyway. I just cut them off when I’m removing the baby to keep the mother looking nice. Great tips . I have a lot of string of pearls . I wish to multiply them. Have you tried ( and had success) with propagating the string of pearls in water ? Thanks! 🙂 You’re lucky you can grow these outside, jealous! Hi Amy.. I just wanted to find out if cutting off the entire string of babies from the mother Spider Plant will help the mother to get bigger. Thanks…. Yes, cutting off all of the spider plant offshoots will help the mother plant get larger since it won’t be putting so much energy into growing the babies. 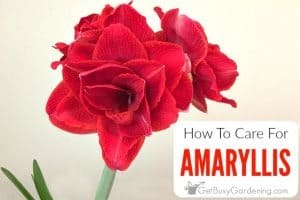 Hi Amy, I had taken babies from a friend’s spider plant. Rooted them in water. That was about 18 months ago. Plant is doing great but no babies. How long does it take for mother to start shooting out babies ? Spider plants don’t have to be very big in order to start growing offshoots, but they do need lots of light. I put mine outside in a spot where they’re protected from the full sun during the summer, and keep them in a sunny room during the winter. They always produce tons of babies. I have replanted my babies after they had really good roots. Now that they are planted it doesn’t seem like they are growing. They aren’t dying but they don’t seem to be getting bigger.??? Not sure if that’s normal or if I’m doing something wrong. If you rooted the babies in water, it takes a little time for them to adjust to growing in soil. At first, the baby will put all it’s energy into developing stronger roots. As long as it looks healthy, then it sounds like it’s ok. Give it more time, and I bet you’ll start to see new growth in a few weeks. You could try leaving the baby attached, but usually when the stem between the mother and the baby gets crushed or broken, that means the baby won’t grow anymore. I would try leaving the baby spider pup attached, and rooting it in a pot of moist soil. Dip the bottom in rooting hormone, and just set the baby upright on top of the soil. Then cover it with a baggie or something for humidity, and to keep the soil moist. It might end up growing roots if it’s large enough. But if the baby spider plant is really small, then it probably won’t make it. Good luck!